Sharvaniharan added a comment to T217373: Create feed card for editor tasks and update iconography. Add descriptions has been unlocked (3 non-reverted edits): Daily suggestions for “Add descriptions“ are shown in the feed. Sharvaniharan moved T220218: Context menu (long press) has extremely light grey text with the dark and black themes from Backlog to Doing on the Wikipedia-Android-App-Backlog (Android-app-release-v2.7.28x-M-Mochi) board. Sharvaniharan claimed T220218: Context menu (long press) has extremely light grey text with the dark and black themes. Sharvaniharan moved T117380: [Dev] Crash report description should include device locale from Doing to Code Review on the Wikipedia-Android-App-Backlog (Android-app-release-v2.7.28x-M-Mochi) board. Sharvaniharan moved T117380: [Dev] Crash report description should include device locale from Backlog to Doing on the Wikipedia-Android-App-Backlog (Android-app-release-v2.7.28x-M-Mochi) board. Sharvaniharan claimed T117380: [Dev] Crash report description should include device locale. Sharvaniharan moved T215255: Review app to find re-used translations from Doing to Code Review on the Wikipedia-Android-App-Backlog (Android-app-release-v2.7.28x-M-Mochi) board. Sharvaniharan moved T206855: mobile-html: Android prototype from Backlog to Done on the Wikipedia-Android-App-Backlog (Android-app-release-v2.7.28x-M-Mochi) board. Sharvaniharan claimed T215255: Review app to find re-used translations. Sharvaniharan moved T215255: Review app to find re-used translations from Backlog to Doing on the Wikipedia-Android-App-Backlog (Android-app-release-v2.7.28x-M-Mochi) board. @schoenbaechler Could you please let me know the margins when there is no image? Sharvaniharan moved T219462: Provide an option to enable/disable all cards related to “Suggested edits“ from Doing to Code Review on the Wikipedia-Android-App-Backlog (Android-app-release-v2.7.28x-M-Mochi) board. Sharvaniharan moved T217373: Create feed card for editor tasks and update iconography from Doing to Code Review on the Wikipedia-Android-App-Backlog (Android-app-release-v2.7.28x-M-Mochi) board. Sharvaniharan moved T219462: Provide an option to enable/disable all cards related to “Suggested edits“ from Backlog to Doing on the Wikipedia-Android-App-Backlog (Android-app-release-v2.7.28x-M-Mochi) board. Sharvaniharan moved T217373: Create feed card for editor tasks and update iconography from Backlog to Doing on the Wikipedia-Android-App-Backlog (Android-app-release-v2.7.28x-M-Mochi) board. Sharvaniharan moved T217170: Visual changes to translate descriptions from Did not pass QA to QA signoff on the Wikipedia-Android-App-Backlog (Android-app-release-v2.7.27x-L-Lamington) board. Sharvaniharan added a comment to T217170: Visual changes to translate descriptions. Hmm interesting, I find it’s poorly designed with that huge gap. 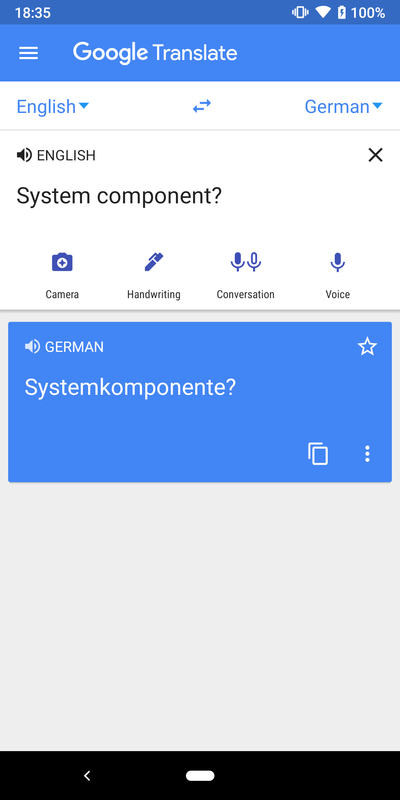 What component is Google Translate using here? Unable to makeout the difference between the two 😂 . Can I refer to zeplin and make it 9dp margin on top and 19dp on bottom? 02 Move plus icon and label ("Add German translation") 12dp lower (the values in sp are still a mystery to me). Please use the “After“ screenshot below (Pixel 3) to adjust the position accordingly. Sharvaniharan moved T217170: Visual changes to translate descriptions from Code Review to Design signoff on the Wikipedia-Android-App-Backlog (Android-app-release-v2.7.27x-L-Lamington) board. Sharvaniharan moved T217170: Visual changes to translate descriptions from Blocked/Waiting to Code Review on the Wikipedia-Android-App-Backlog (Android-app-release-v2.7.27x-L-Lamington) board. Sharvaniharan moved T217562: Update Info/help screen concept from Did not pass QA to QA signoff on the Wikipedia-Android-App-Backlog (Android-app-release-v2.7.27x-L-Lamington) board. Sharvaniharan moved T217373: Create feed card for editor tasks and update iconography from Doing to Code Review on the Wikipedia-Android-App-Backlog (Android-app-release-v2.7.27x-L-Lamington) board. Sharvaniharan moved T219462: Provide an option to enable/disable all cards related to “Suggested edits“ from Backlog to Doing on the Wikipedia-Android-App-Backlog (Android-app-release-v2.7.27x-L-Lamington) board. Sharvaniharan claimed T219462: Provide an option to enable/disable all cards related to “Suggested edits“. Sharvaniharan added a comment to T219462: Provide an option to enable/disable all cards related to “Suggested edits“. ok cool! that makes it easier then..
@schoenbaechler so other main reason for a separate ticket was to group them and further give the user an option to individually turn them on/off as well... so which would mean, we indicate in ui that 'Suggested edits' is a group, and on clicking it, it will expose the various types of cards grouped under it.. like suggested edit add description, suggested edit translate description,suggested edit image... etc.. which can also then be turned on/off individually.. If you feel that is how we should proceed, then this ticket should include design to do that as well? Sharvaniharan added a comment to T217562: Update Info/help screen concept. @schoenbaechler should this verbiage be change on the main drawer too, or just here? Sharvaniharan updated the task description for T217373: Create feed card for editor tasks and update iconography. Sharvaniharan moved T217562: Update Info/help screen concept from QA signoff to Design signoff on the Wikipedia-Android-App-Backlog (Android-app-release-v2.7.27x-L-Lamington) board. Sharvaniharan moved T217562: Update Info/help screen concept from Design signoff to QA signoff on the Wikipedia-Android-App-Backlog (Android-app-release-v2.7.27x-L-Lamington) board. Sharvaniharan moved T217562: Update Info/help screen concept from Code Review to QA signoff on the Wikipedia-Android-App-Backlog (Android-app-release-v2.7.27x-L-Lamington) board. Sharvaniharan added a comment to T218439: Crash report. @Dbrant I looked at the APP_VERSION_NAME that it was old... but I was curious what transaction was as big as a parcel size of 666064 bytes. So asked the user for more details just to verify it is not happening anymore [ not that it has come to our notice anywhere else]. I would have closed it in any case other than currently reproducible steps. Sharvaniharan created T218439: Crash report. Sharvaniharan renamed T218438: Deep link is not working from Deep link is not working in to Deep link is not working . Sharvaniharan created T218438: Deep link is not working . Sharvaniharan claimed T217373: Create feed card for editor tasks and update iconography. Sharvaniharan moved T217373: Create feed card for editor tasks and update iconography from Ready for dev to Doing on the Wikipedia-Android-App-Backlog (Android-app-release-v2.7.27x-L-Lamington) board. Sharvaniharan moved T217562: Update Info/help screen concept from Doing to Code Review on the Wikipedia-Android-App-Backlog (Android-app-release-v2.7.27x-L-Lamington) board. Sharvaniharan moved T217170: Visual changes to translate descriptions from Doing to Blocked/Waiting on the Wikipedia-Android-App-Backlog (Android-app-release-v2.7.27x-L-Lamington) board. Sharvaniharan claimed T217562: Update Info/help screen concept. Sharvaniharan moved T214504: Add activity for lists that contain X article + list links from Did not pass QA to Design signoff on the Wikipedia-Android-App-Backlog (Android-app-release-v2.7.27x-L-Lamington) board. @schoenbaechler Can we limit the Rtl support to in-app components only, and not change the direction of the support toolbar? Which would mean the translation card would be rtl, but the title and arrow and overflow would still be inline with the system language. Sharvaniharan moved T216856: Article view does not show in the center in landscape mode on a tablet from Doing to Code Review on the Wikipedia-Android-App-Backlog (Android-app-release-v2.7.27x-L-Lamington) board. Sharvaniharan moved T216856: Article view does not show in the center in landscape mode on a tablet from Ready for dev to Doing on the Wikipedia-Android-App-Backlog (Android-app-release-v2.7.27x-L-Lamington) board. Sharvaniharan claimed T216856: Article view does not show in the center in landscape mode on a tablet. Sharvaniharan added a comment to T214504: Add activity for lists that contain X article + list links. @schoenbaechler according to our conversation, I have referenced the new color groups as 'chip_background_color' and 'chip_text_color'. Sharvaniharan moved T214504: Add activity for lists that contain X article + list links from Code Review to Design signoff on the Wikipedia-Android-App-Backlog (Android-app-release-v2.7.27x-L-Lamington) board. Sharvaniharan moved T214504: Add activity for lists that contain X article + list links from Did not pass QA to Code Review on the Wikipedia-Android-App-Backlog (Android-app-release-v2.7.27x-L-Lamington) board. Sharvaniharan moved T217170: Visual changes to translate descriptions from Ready for dev to Doing on the Wikipedia-Android-App-Backlog (Android-app-release-v2.7.27x-L-Lamington) board. Sharvaniharan claimed T217170: Visual changes to translate descriptions. 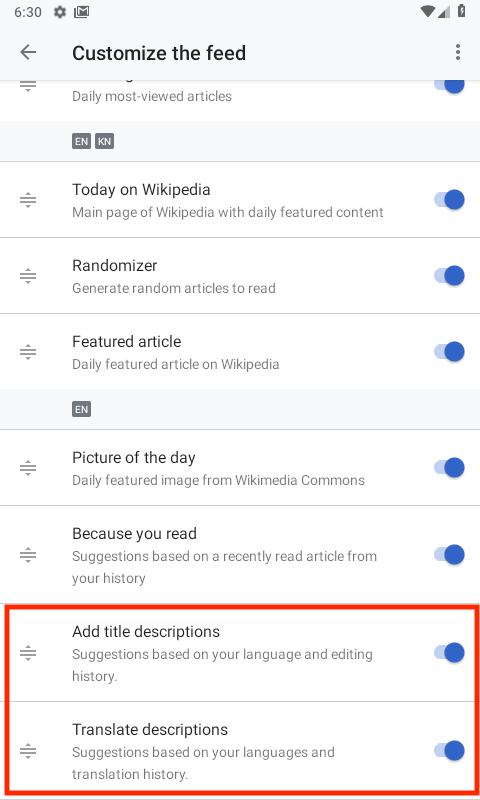 Sharvaniharan moved T214504: Add activity for lists that contain X article + list links from Doing to Design signoff on the Wikipedia-Android-App-Backlog (Android-app-release-v2.7.27x-L-Lamington) board. Sharvaniharan created T216277: Make Apptheme inherit from MaterialComponents/its descendants. @schoenbaechler Could you please update the designs to reflect what should happen when page items have multiline descriptions? Sharvaniharan claimed T206855: mobile-html: Android prototype. Sharvaniharan updated the task description for T215255: Review app to find re-used translations. Sharvaniharan placed T215255: Review app to find re-used translations up for grabs. Sharvaniharan moved T215255: Review app to find re-used translations from Done to Ready for dev on the Wikipedia-Android-App-Backlog (Android-app-release-v2.7.27x-L-Lamington) board. Sharvaniharan added a comment to T215255: Review app to find re-used translations. Ah! That would be the android.R.string. * strings. I assumed only the strings that were created and translated by us, but yes over all I guess they must be reviewed as well. Will move this back to ready-to-dev in that case. We can convert all those places to local strings, also making it a coding standard going forward not to use general android strings, maybe? I have taken care of "OK", "Cancel", "Yes", and "No" messages. Infact, all the strings are single use right now, other than the ones I documented here : https://docs.google.com/spreadsheets/d/1DNweLAylPjIZ1_Vmx7voZnDwdseB8QXzAvkrF0ZIeYE/edit?usp=sharing why I have ignored them. But yes, the ticket is far from done till we review the document and agree upon ignoring them... I just assumed it was, since the change was merged. Where should we move this to? Sharvaniharan moved T214786: In the Wikipedia Android App, the onboarding_skip message is reused from Doing to Done on the Wikipedia-Android-App-Backlog (Android-app-release-v2.7.27x-L-Lamington) board. Sharvaniharan moved T215255: Review app to find re-used translations from Doing to Done on the Wikipedia-Android-App-Backlog (Android-app-release-v2.7.27x-L-Lamington) board. Sharvaniharan claimed T214504: Add activity for lists that contain X article + list links. Sharvaniharan moved T214504: Add activity for lists that contain X article + list links from Ready for dev to Doing on the Wikipedia-Android-App-Backlog (Android-app-release-v2.7.27x-L-Lamington) board. Sharvaniharan moved T215255: Review app to find re-used translations from Backlog to Doing on the Wikipedia-Android-App-Backlog (Android-app-release-v2.7.27x-L-Lamington) board. Sharvaniharan moved T209539: On boarding screens for the App Editor task list from QA signoff to Ready for signoff on the Wikipedia-Android-App-Backlog (Android-app-release-v2.7.27x-L-Lamington) board. Sharvaniharan moved T209539: On boarding screens for the App Editor task list from Needs Design/Design doing to QA signoff on the Wikipedia-Android-App-Backlog (Android-app-release-v2.7.27x-L-Lamington) board. Sharvaniharan claimed T214786: In the Wikipedia Android App, the onboarding_skip message is reused. Sharvaniharan moved T214786: In the Wikipedia Android App, the onboarding_skip message is reused from Backlog to Doing on the Wikipedia-Android-App-Backlog (Android-app-release-v2.7.27x-L-Lamington) board. Sharvaniharan moved T214492: Open “Explore“ search result item in the existing tab if it’s already open from Code Review to QA signoff on the Wikipedia-Android-App-Backlog (Android-app-release-v2.7.27x-L-Lamington) board. Sharvaniharan moved T214492: Open “Explore“ search result item in the existing tab if it’s already open from Doing to Code Review on the Wikipedia-Android-App-Backlog (Android-app-release-v2.7.27x-L-Lamington) board. Sharvaniharan moved T214492: Open “Explore“ search result item in the existing tab if it’s already open from Backlog to Doing on the Wikipedia-Android-App-Backlog (Android-app-release-v2.7.27x-L-Lamington) board. Sharvaniharan claimed T214492: Open “Explore“ search result item in the existing tab if it’s already open. Sharvaniharan added a comment to T214492: Open “Explore“ search result item in the existing tab if it’s already open. Sharvaniharan closed T214745: [Recurring BUG] 'About this article' section is overlapping as Invalid. Part of the CSS outage. Will be automatically resolved when that is fixed. Sharvaniharan created T214745: [Recurring BUG] 'About this article' section is overlapping. Sharvaniharan created T214667: [BUG] Pages in a category are not shown . Sharvaniharan renamed T214666: [BUG] Offline articles get deleted after a few days from [BUG} Offline articles get deleted after a few days to [BUG] Offline articles get deleted after a few days. Sharvaniharan renamed T214666: [BUG] Offline articles get deleted after a few days from Offline articles get deleted after a few days to [BUG} Offline articles get deleted after a few days. Sharvaniharan created T214666: [BUG] Offline articles get deleted after a few days. 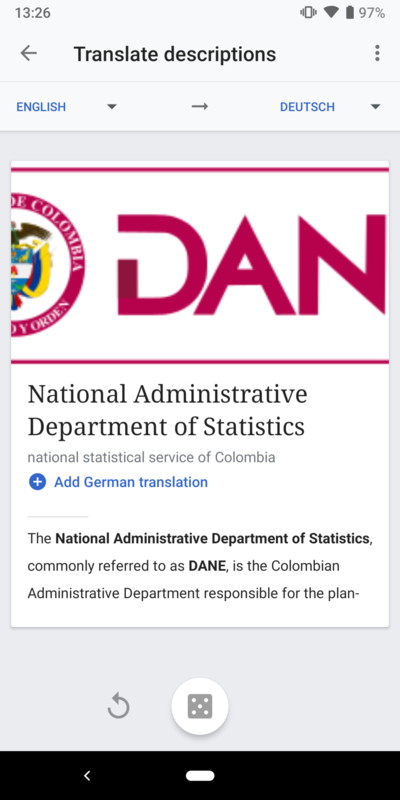 Sharvaniharan added a comment to T207334: Create a UI for Translating title descriptions (within the App Editor Tasks list). Sharvaniharan updated the task description for T211109: Create testable prototype for user testing the Edit action queue (add and translate title descriptions only). Sharvaniharan added a comment to T211109: Create testable prototype for user testing the Edit action queue (add and translate title descriptions only). @schoenbaechler @RHo @dchen @Charlotte final apk link has been updated. @cmadeo Thank you for the suggestions. I was actually able to have a chat with @schoenbaechler before he left for the day and he was able to clarify. Other than the last point , the back button functionality... rest were the same. Will re-confirm with him tomorrow. Description: Translation tasks are available if you read and write in more than one Wikipedia language.